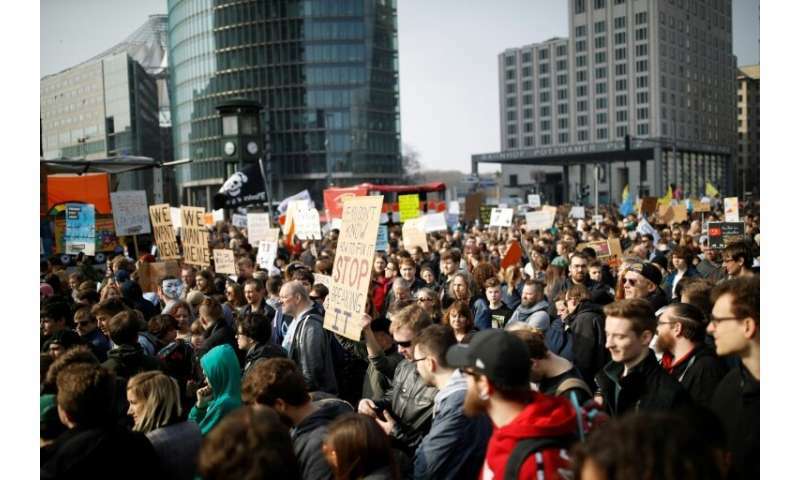 Crowds protested in Berlin, Munich and other cities under the slogan “Save the Internet”. They called on the European Parliament to reject the reform in a vote scheduled for Tuesday. The overhaul of EU online copyright law includes proposals to oblige YouTube and other platforms to remove illegal content using automatic filters. It also aims to make internet companies pay more to news organisations for reproducing or linking to their content. News organisations, including AFP, have pushed for that move. They argue that companies such as Facebook and Google make billions in revenue from advertising tied to news stories, while publishers suffer. Protesters and internet companies such as Google say the reform will harm freedom of information and small publishers on the internet. Organisers said some 15,000 people rallied in Berlin and 40,000 in Munich. They waved signs reading “Don’t break our internet”. The German Pirate party has been among the leaders of resistance to the reform. Rallies were also called in other countries including Austria, Poland and Portugal. More than 260 journalists and photographers signed an article published on Friday calling for the reform to be passed. In Poland, more than 200 film-makers called in an open letter for MEPs to pass the measures, in order to regulate use of their intellectual property on video platforms such as YouTube.